A previous posting discussed the selection of sampling rates. 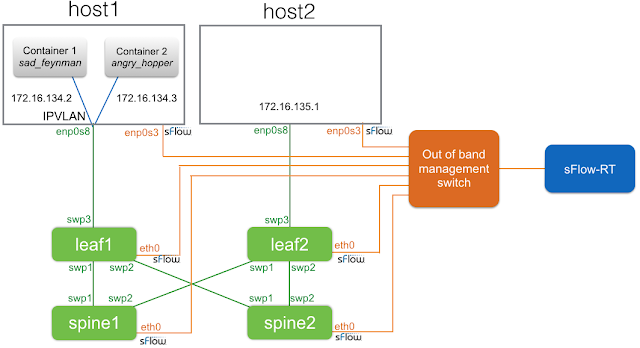 Additional information can be found in the OpenSwitch sFlow User Guide. See Trying out sFlow for suggestions on getting started with sFlow monitoring and reporting. Cisco Tetration Analytics: the most Comprehensive Data Center Visibility and Analysis in Real Time, at Scale, June 15, 2016, announced the new Cisco Tetration Analytics platform. The platform collects telemetry from proprietary agents on servers and embedded in hardware on certain Nexus 9k switches, analyzes the data, and presents results via Web GUI, REST API, and as events. No pricing is given, but based on the hardware, data center space, power and cooling requirements, this brute force approach to analytics will be reassuringly expensive to purchase and operate. Update June 22, 2016: See 451 Research report, Cisco Tetration: a $3m, 1,700-pound appliance for network traffic analytics is born, for pricing information. A much less expensive alternative is to use industry standard sFlow agents embedded in Cisco Nexus 9k/3k switches and in switches from over 40 other vendors. The open source Host sFlow agent extends visibility to servers and applications by streaming telemetry from Linux, Windows, FreeBSD, Solaris, and AIX operating system, hypervisors, Docker containers, web servers (Apache, NGINX, Tomcat, HAproxy) and Java application servers. The diagram shows how the sFlow-RT real-time analytics engine receives a continuous telemetry stream from sFlow instrumentation build into network, server and application infrastructure and delivers analytics through APIs and can easily be integrated with a wide variety of on-site and cloud, orchestration, DevOps and Software Defined Networking (SDN) tools. Minimizing cost of visibility describes why lightweight monitoring is critical to realizing the value that telemetry can bring to improving operational efficiency. 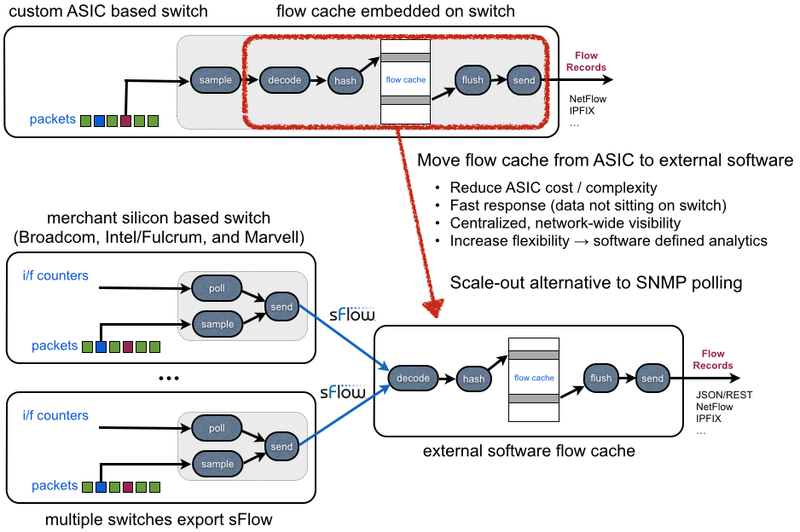 In the case of the sFlow based solution, the critical data path instrumentation is built into the switch ASICs and in the Linux kernel, ensuring that there is negligible impact on operational performance. The sFlow-RT analytics software shown in the diagram provides real-time (sub second) visibility for 5,000 unique end points (Virtual Machines or Bare metal server), the upper limit of scaleability in the Tetration data sheet, using a single virtual machine or Docker container with 4 GBytes of RAM and 4 CPU cores. With additional memory and CPU the solution easily scales to 100,000 unique end points. How can sFlow provide real-time visibility at scale and consume so few resources? Shrink ray describes how advanced statistical techniques are used to select and analyze measurements that capture the essential features of network and system performance. A statistical approach yields fast, accurate answers, while minimizing the resources required to measure, transport and analyze the data. The sFlow-RT analytics platform was selected as an example because of the overlap in capabilities with the Cisco Tetration analytics platform. However, sFlow is non-proprietary and there are many other open source and commercial sFlow analytics solutions listed on sFlow.org. The Cisco press release states, "Available in July 2016, the first Tetration platform will be a full rack appliance that is deployed on-premise at the customer’s data center." On the other hand, the sFlow based solution described here is available today and can be installed and running in minutes on a virtual machine or in a Docker container. Barefoot Networks recently came out of stealth to reveal their Tofino 6.5Tbit/second (65 X 100GE or 260 X 25GE) fully user-programmable switch. The diagram above, from the talk Programming The Network Data Plane by Changhoon Kim of Barefoot Networks, shows the Protocol Independent Switch Architecture (PISA) of the programmable switch silicon. Network visibility is one of the major use cases for P4 based switches. Improving Network Monitoring and Management with Programmable Data Planes describes how P4 can be used to collect information about latency and queueing in the switch forwarding pipeline. The document also describes an architecture for In-band Network Telemetry (INT) in which the ingress switch is programmed to insert a header containing measurements to packets entering the network. Each switch in the path is programmed to append additional measurements to the packet header. The egress switch is programmed to remove the header so that the packet can be delivered to its destination. The egress switch is responsible for processing the measurements or sending them on to analytics software. Transporting measurement headers is complex with different encapsulations for each transport protocol: Geneve, VxLAN, etc. Addition of headers increases the size of packets and risks causing traffic to be dropped downstream due to maximum transmission unit (MTU) restrictions. The number of measurements that can be added by each switch and the number of switches adding measurements in the path needs to be limited. In-band telemetry cannot be incrementally deployed. Ideally, all devices need to participate, or at a minimum, the ingress and egress devices need to be in-band telemetry aware. In-band telemetry transports data from the data plane to the control/management planes, providing a potential attack surface that could be exploited by crafting malicious packets with fake measurement headers. Extensibility of sFlow protocol allows additional forwarding plane measurements to augment standard sFlow measurements, fully integrating the new measurements with sFlow data exported from other switches in the network (sFlow is supported by over 40 switch vendors and is a standard feature of switch ASICs). sFlow's is a unidirectional telemetry transport protocol originates from the device management plane, can be sent out of band, limiting possible attack surfaces. The great thing about programmable hardware is that behavior can be modified by changing the software. Implementing out of band telemetry is a matter of combining measurements from the P4 INT code with the P4 sFlow agent code. Compiling and installing out of band sFlow telemetry code reprograms the hardware to implement the new scheme. The advent of P4 and programmable hardware opens up exciting possibilities for defining additional packet sample metadata, counters, and gauges to augment the sFlow telemetry stream and gain additional insight into the performance of production traffic in large scale, high capacity, networks. 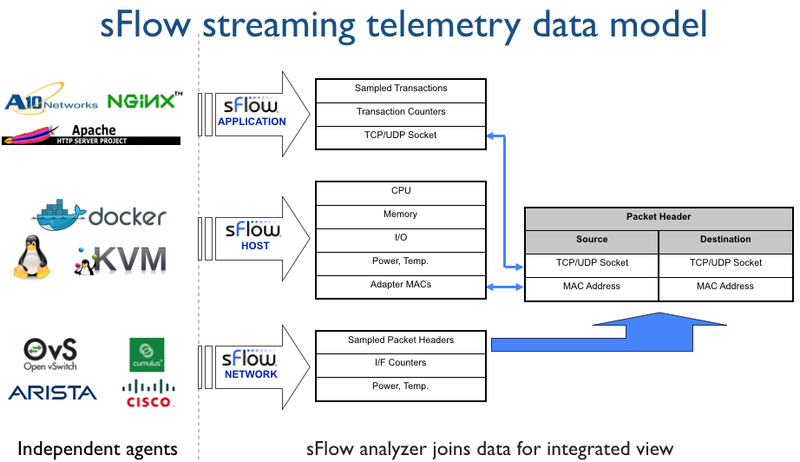 The real-time sFlow streaming telemetry can be used to drive automated controls, for example, to block DDoS attacks, or load balance large "Elephant" flows across multiple paths. Here again P4 combined with programmable hardware makes it possible to create additional control capabilities, for example, to be able to block the large numbers of source addresses involved in a DDoS attack, where sFlow analytics would be used to identify the attackers and their points of ingress and program each of the switches with filters based on their location in the network. The ability to customize the hardware to address specific tasks makes more efficient use of hardware resources than is possible with fixed function device. In this case, defining a specialized DDoS drop table would allow for a much larger number of filters than would be possible with a general purpose ACL table. Drivers for growth describes how switches built on merchant silicon from Broadcom ASICs dominate the current generation of data center switches, reduce hardware costs, and support an open ecosystem of switch operating systems (Cumulus Linux, OpenSwitch, Dell OS10, Broadcom FASTPATH, Pica8 PicOS, Open Network Linux, etc.). The router market is poised to be similarly disrupted with the introduction of devices based on Broadcom's Jericho ASIC, which has the capacity to handle over 1 million routes in hardware (the full Internet routing table is currently around 600,000 routes). Broadcom Jericho ASICs are currently available in Arista 7500R/7280R routers and in Cisco NCS 5000 series routers. Expect further disruption to the router market when white box versions of the 1U router hardware enter the market. There was general enthusiasm for Broadcom Jericho based routers in a recent discussion on the North American Network Operators' Group (NANOG) mailing list, Arista Routing Solutions, so merchant silicon based routers should be expected to sell well. See EOS System Configuration Guide for details. See Netflow Configuration Guide for Cisco NCS 5500 Series Routers, IOS XR Release 6.0.x for configuration details and limitations. We are still not done, further steps are required to enable the equivalent to sFlow's streaming telemetry. "Identifier": "data that may be sent by the encoder to the mgmt stn"
See Cisco IOS XR Telemetry Configuration Guide for details. 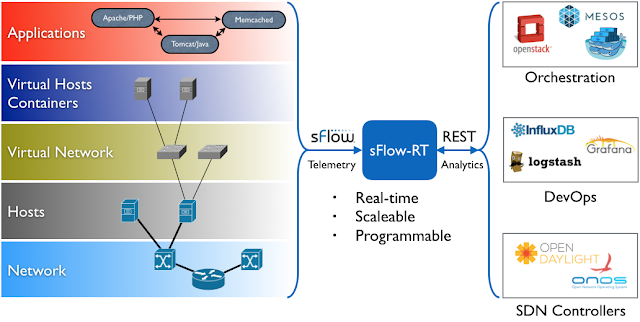 Software defined analytics describes how the sFlow architecture disaggregates the flow analytics pipeline and integrates telemetry export to reduce complexity and increase flexibility. The reduced configuration complexity is clearly illustrated by the two configuration examples above. Unlike the complex and disparate monitoring mechanisms in IOS XR, sFlow offers a simple, flexible and unified monitoring solution that exposes the full monitoring capabilities of the Broadcom Jericho ASIC. Expect a future release of IOS XR to add the sFlow support since sFlow a natural fit for the hardware capabilities of Jericho based router platforms and the addition of sFlow support will provide feature parity with Cisco's merchant silicon based switches. The OpenConfig project has been getting a lot of attention lately. A number of large network operators, lead by Google, are developing "a consistent set of vendor-neutral data models (written in YANG) based on actual operational needs from use cases and requirements from multiple network operators." The OpenConfig project extends beyond configuration, "Streaming telemetry is a new paradigm for network monitoring in which data is streamed from devices continuously with efficient, incremental updates. Operators can subscribe to the specific data items they need, using OpenConfig data models as the common interface." 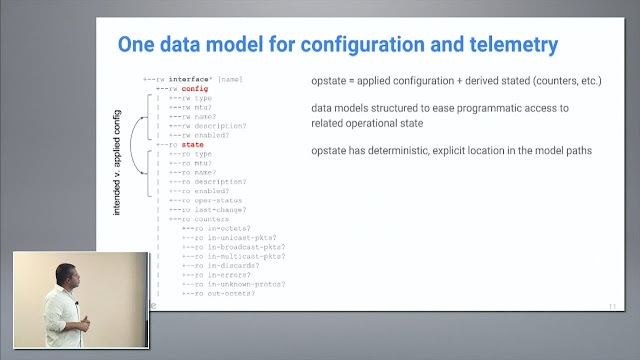 Anees Shaikh's Network Field Day talk provides an overview of OpenConfig and includes an example that demonstrates how configuration and state are combined in a single YANG data model. In the example, read/write config attributes used to configure a network interface (name, description, MTU, operational state) are combined with the state attributes needed to verify the configuration (MTU, name, description, oper-status, last-change) and collect metrics (in-octets, in-ucast-pkts, in-broadcast-pkts, ...). Anees positions OpenConfig streaming telemetry mechanism as an attractive alternative to polling for metrics using Simple Network Management Protocol (SNMP) - see Push vs Pull for a detailed comparison between pushing (streaming) and pulling (polling) metrics. Streaming telemetry is not unique to OpenConfig. Industry standard sFlow is a streaming telemetry alternative to SNMP that has seen rapid vendor adoption over the last decade. Drivers for growth discusses how the rise of merchant silicon and virtualization have accelerated adoption of sFlow, particularly in data centers. The table compares sFlow and OpenConfig Telemetry. There are a number of similarities: sFlow and OpenConfig are both driven by participation based organizations that publish standards to ensure multi-vendor interoperability, and both push standard sets of metrics using standard encodings over widely supported transport protocols. However, important differences result from OpenConfig's exclusive focus on large service provider configuration and monitoring requirements. Telemetry is tied to the hierarchical YANG configuration models, making it easy to correlate operational and configured state, but limiting the scope of monitoring to the management and control planes of devices that are configured using OpenConfig. In contrast, sFlow is a management and control plane agnostic monitoring technology (i.e. a device may be configured using CLI, NetConf, JSON RPC, OpenConfig, etc. to use any control plane OpenFlow, BGP, OSPF, TRILL, spanning tree, etc.). In addition, sFlow is primarily concerned with the data and control planes, i.e. capturing information about packets and forwarding actions. The article, Management, control and data planes in network devices and systems, by Ivan Pepelnjak, provides background on data, control, and management plane terminology. Gathering data plane telemetry requires hardware support and merchant silicon vendors (Broadcom, Cavium/XPliant, Intel/Fulcrum, Marvell etc.) include sFlow instrumentation in their switching/routing ASICs. Embedded hardware support allows sFlow to efficiently stream standardized data plane telemetry from all devices in a large multi-vendor network. To conclude, sFlow and OpenConfig shouldn't be viewed as competing technologies. Instead, the complementary capabilities of sFlow and OpenConfig and shared architectural model make it easy to combine sFlow and OpenConfig into an integrated management solution that unifies monitoring and control of management, control, and data planes. The recently released Raspberry Pi Zero (costing $5) is an example of the type of embedded low power computer enabling IoT. These small devices are typically wired to one or more sensors (measuring temperature, humidity, location, acceleration, etc.) and embedded in or attached to physical devices. Discovery - How are newly connected devices discovered? Configuration - How can the numerous individual devices be efficiently configured? Transport - How efficiently are measurements transported and delivered? 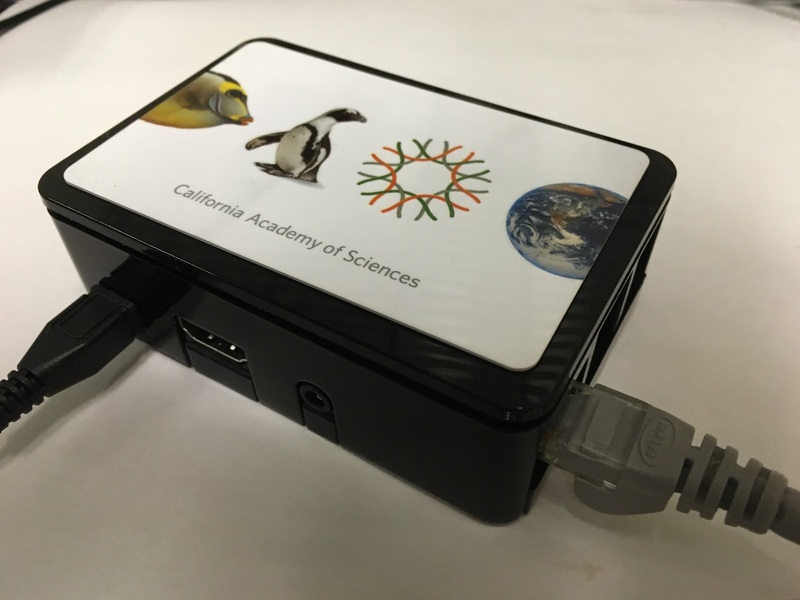 Latency - How long does it take before measurements are remotely accessible? This article will use the Raspberry Pi as an example to explore how the architecture of the industry standard sFlow protocol and its implementation in the open source Host sFlow agent provide a method of addressing the challenges of embedded device monitoring. The following steps describe how to install the Host sFlow agent on Raspbian Jesse (the Debian Linux based Raspberry Pi operating system). The configuration is not device specific - this same configuration can be pre-loaded in every device. 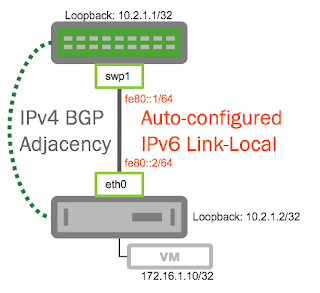 Prefer IPv6 addresses as a way of identifying the agent since they are more likely to be globally unique. DNS Service Discovery (DNS-SD) is used to retrieve dynamic configuration on startup and to periodically refresh the configuration. Hosting a single copy of the configuration (in the form of SRV and TXT records on the DNS server responsible for the sf.inmon.com domain) minimize the complexity of managing large numbers of devices. 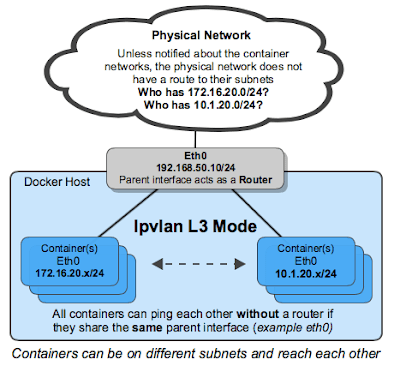 Network visibility provides a way to monitor the interactions between the devices on the network. The pcap entry enables a Berkeley Packet Filter to efficiently sample network traffic using instrumentation built into the Linux kernel. Custom Metrics can be be sent along with the extensive set of standard sFlow metrics by including the jsonPort entry. _sflow._udp   30  SRV     0 0 6343  collector.sf.inmon.com. In this case, the SRV record specifies that sFlow records should be sent via UDP to collector.sf.inmon.com on port 6343. The TTL is set to 30 seconds so that agents will pick up any changes within 30 seconds. A larger TTL should be used to improve scaleability if there are large numbers of devices. The Host sFlow agent will automatically pick up the configuration via a DNS request, start making measurements, which are immediately send in standard sFlow UDP datagrams to the designated sFlow collector collector.sf.inmon.com. sFlow's immediate transmission of measurements minimizes the memory requirements on the agent (since data doesn't have to be stored for later retrieval) and minimizes the latency before measurements are accessible on the collector (and can be acted on). It should also be noted that all communication is initiated by the device (DNS requests and transmission of telemetry via sFlow). This means that the radio on the device can be powered down between transmissions to save power (and extend battery life if the device is battery powered). Note the custom temperature metric at the end of the list. In addition, enabling traffic monitoring in the Host sFlow agent provides detailed flow information along with the metrics to provide visibility into interactions between the devices on the network. In this case the wired Ethernet interface (eth0) is being monitored, but monitoring the wireless interface (wlan0) would be a way to gain visibility into messages exchanged over an ad-hoc wireless mesh network connecting devices. RESTflow describes how to perform flow analytics using sFlow-RT. In conclusion, sFlow provides a standard way to export metrics and traffic information. Most network equipment vendors already provide sFlow support and the technology has a number of architectural features that are well suited to addressing the challenges of extending visibility to and gathering telemetry from large scale IoT deployments. OVS Orbit Episode 6 is a wide ranging discussion between Ben Pfaff and Peter Phaal of the industry standard sFlow measurement protocol, implementation of sFlow in Open vSwitch, network analytics use cases and application areas supported by sFlow, including: OpenStack, Open Network Virtualization (OVN), DDoS mitigation, ECMP load balancing, Elephant and Mice flows, Docker containers, Network Function Virtualization (NFV), and microservices. Follow the link to see listen to the podcast, read the extensive show notes, follow related links, and to subscribe to the podcast. 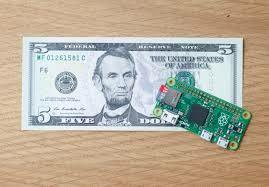 The Raspberry Pi model 3b is not much bigger than a credit card, costs $35, runs Linux, has a 1G RAM, and powerful 4 core 64 bit ARM processor. This article will demonstrate how to turn the Raspberry Pi into a Terribit/second real-time network analytics engine capable of monitoring hundreds of switches and thousands of switch ports. The diagram shows how the sFlow-RT real-time analytics engine receives a continuous telemetry stream from industry standard sFlow instrumentation build into network, server and application infrastructure and delivers analytics through APIs and can easily be integrated with a wide variety of on-site and cloud, orchestration, DevOps and Software Defined Networking (SDN) tools. A future article will examine how the Host sFlow agent can be used to efficiently stream measurements from large numbers of inexpensive Rasberry Pi devices ($5 for model Zero) to the sFlow-RT collector to monitor and control the "Internet of Things" (IoT). The following instructions show how to install sFlow-RT on Raspbian Jesse (the Debian Linux based Raspberry Pi operating system). We are ignoring the dependency on openjdk and will use the default Raspbian Java 1.8 version instead. These new settings reduce the requested memory to fit within the 1G on the Raspberry Pi and leave some memory for system tasks. The G1GC garbage collector not available on ARM Java implementation, so we will use incremental concurrent mark and sweep instead. Finally, Agents provides information on configuring devices to send sFlow to the Raspberry Pi analyzer. Visit the http://<raspberrypi_ip>:8008/agents/html page to verify that data is being received. In addition, there are a number of open source sFlow-RT Applications available on the Downloads page (e.g. Mininet dashboard, DDoS mitigation, etc.) and articles describing use cases for sFlow-RT on this blog.